Seven-time marathon finisher, author and generous soul, Andrew Smith has achieved a lot in the 8 years since he first took up running. But it wasn’t always this straightforward. 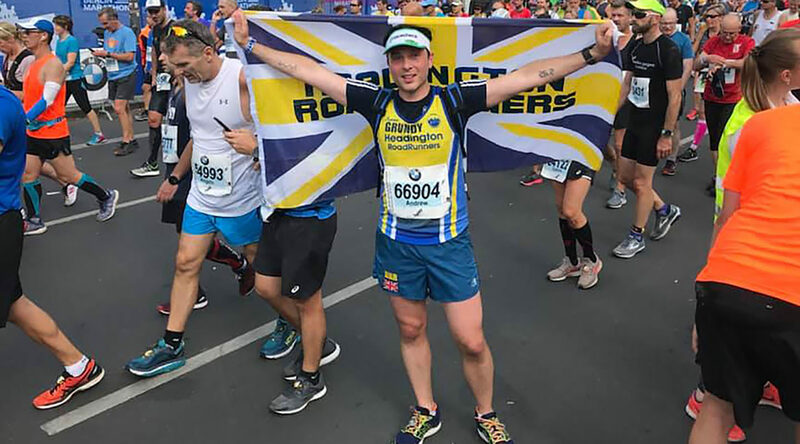 In his earlier days, 26 miles of marathon running seemed like a stretch too far for Andrew, who grappled with self-doubt, unsure whether he had it in him to go the distance. Channelling his determination, clubmate encouragement and months of relentless training he was able to achieve his ambition in 2014, but it left him hungry for more. A work colleague signed up to run a 7km race at Blenheim Palace in 2011, and talked me into it having not run since school. I finished the race and found that I enjoyed it so continued to run in my spare time. I found out that Oxford, where I lived at the time, had a high number of local events so decided to enter another race, and it soon became a bit of an addiction. I met some runners from a local club named Headington RoadRunners who provided a supporting and non-judgmental environment in which I was able to train and get better. I have now been a member of the club for six years. What’s your favourite running story? Not a story as such, but marathons provide a good sense of community spirit among runners. You find yourself talking to the runner next to you quite a bit, especially during the hard miles. The toughest part I ever found was when I was overheating during the Berlin Marathon in 2018 and needed anything to keep me moving forward. Normally I interact with the people watching from the side to take my mind off the pain. However everyone spoke German so I didn’t have a clue what they were shouting at me. I wish I had listened more in my language lessons at school! A fellow runner who overcame cancer and documented how running kept her focused during recovery once said that “running is the celebration for the good times, and therapy for the bad”. This quote has stayed with me for a long long time. I have found that running sees a positive reflection in my mental health at times when there is stress in my life. It can give you some time on your own, outside, where your mind wanders to the environment around you and distracts dark thoughts that may be building in your brain. Running is an activity that’s provided this for a lot of people. I believe that people can see a positive reflection in their mental health by finding something that provides that spark somewhere inside. It doesn’t have to be running, or anything physically demanding. It can be writing, painting or anything. For me, I am motivated to go out in all weather as I know that once I return home I will be in a mentally better place, even if the run itself feels testing that day. The running community is also a motivation, whether this is through Headington RoadRunners, RunThrough events or the social media community. The communities are the areas where I have not personally seen any judgement overall on who you are. Regardless of age, gender, sexuality, race and size, everyone is welcome and encouraged. Marathon running. When I first started at Headington RoadRunners I was trying to improve my speed over ten kilometre races. I never thought I would be able to run for over twenty-six miles. Speaking to clubmates, the question that I was faced with often was “why don’t you feel you will be able to do it?”. Looking back, the answer I had settled on was that I had never seen myself as someone who could run that far. I was introduced to marathons by going to watch one with the club to support our runners. It proved that there is no typical marathon runner. People of all ages and abilities completed the event, and it gave me belief that I could do it one day too. I bit the bullet and entered my first marathon in 2014 and couldn’t believe it when I managed to get round after four months of hard training. Knowing that I could now run that distance, I went back for more and I am in training for my eighth, ninth and tenth marathons! 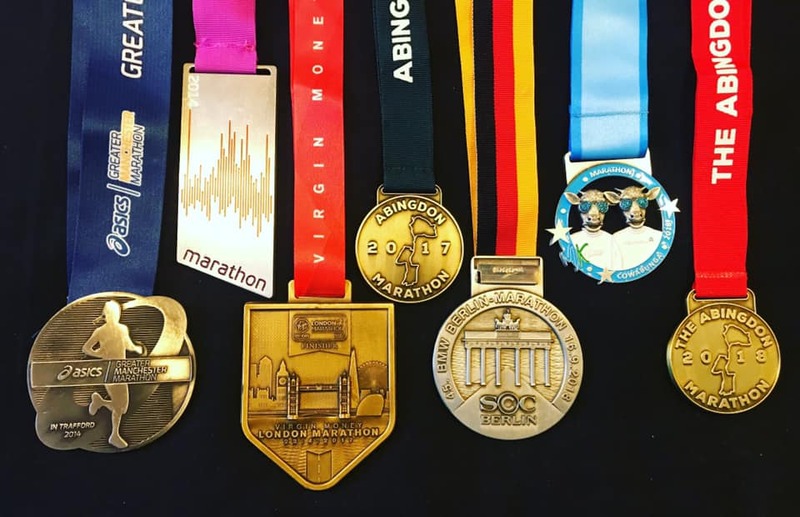 Each marathon is a big achievement, whether that is in a World Major such as London or Berlin, or the smaller scale ones such as Abingdon. What’s been your biggest barrier to success? The biggest barrier is self-doubt. Thinking that I couldn’t achieve something always made me run negatively. Being involved with a club is something I would highly recommend. The support you receive and the guidance to avoid the pitfalls that other people have experienced on their own running journeys helps you to understand the best way to run positively. What advice would you give to your younger self given the chance? Always listen to others and take their advice on board! Someone has made all the mistakes there are in the past, and making sure I listened would have saved me some trouble down the years. Running has taught me to approach things more positively. Since running I have had a complete career change, and now often deliver presentations to groups of people. Public speaking was another thing I found intimidating, but by having the confidence to have a go has seen it all work out okay. Marathon training has also taught me to be more disciplined in terms of time management, and that putting things off doesn’t really give the most effective results. I am more confident, I am mentally in a good place and I have met a massive amount of likeminded people who started off as race rivals but are now close friends. What’s next? What are you training for at the moment? I have three marathons lined up for the Spring in Manchester, London and Liverpool. Training has started for these. Manchester will be an interesting one as I am raising money for Sarcoma UK, and took a bet on last year whereby friends could choose a fancy dress outfit for me to do a race in if they donated. As a result I will be running the Manchester Marathon in drag under the name ‘Ariana Grundy’! I set out to achieve a sub-3hr 45min time for a marathon, and having achieved that last year these marathons are not specifically focused on getting a quicker time. I am there for a good time, not for a good time. You can donate to Andrew’s cause here.